China, Thailand, Malaysia, Taiwan, Hong Kong, Japan (due to presence of Taiwanese community in Tokyo-Yokohama Metropolitan Area), Singapore, Indonesia, Mauritius, Suriname, South Africa, India, Vietnam and other countries where Hakka Chinese-speaking migrants have settled. 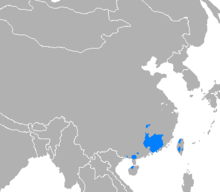 Hakka is a dialect of the Chinese language spoken mainly in southern China by the Hakka people and their descendants now living in East and Southeast Asia and countries around the world. 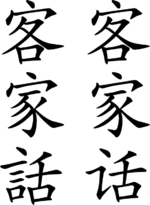 The Hakka Dialect. A Linguistic Study of its Phonology, Syntax and Lexicon, by Mantaro J. Hashimoto. (Cambridge University Press, 1973). This page was last changed on 11 March 2016, at 17:05.